Hello Friends, We have a great challenge for you over at Just Us Girls! Bobby has asked us to use all over Stamping on our card and or project! One of the things I am hoping to do more of in 2017 is coloring. I do enjoy it immensely! So when I saw this upcoming challenge, I knew for sure that I was going to get out my Altenew Stamps (Botanical Garden) and my Prisma colored pencils and get to work. I am thrilled with how this came together, I love coloring on kraft card stock! I tried to get the best photo possible. The Hugs die is from Lawn Fawn and cut from gold paper. I didn’t want to take away from the background to much. Categories: Cards | Tags: Altenew stamps, Card making, Cards, prisma colored pencils, rubber stamps, stamping, Thinking of you | Permalink. What a great coloring job, Nancy! It looks fantastic! Love it!! I love your design with those gorgeous yellow flowers. Thanks so very much! I am working on my coloring skills! It maybe 5 AM, but I am over the top in love with this card. This is my kind of style. I absolutely love everything about it. The design, the coloring and the way the sentiment is kind of melded into the whole thing. I hope that this means that you are feeling better. I don’t like it when your sick. Thanks Sis! I am feeling bette today! I appreciate your kind words…it is your style for sure! This has to be my favorite of all your cards, Nancy. The soft colors, the design layout, the subtle sentiment. It’s all so beautifully done. My jaw is sitting in my lap right now. This card is AMAZING!!! Love the colors you used on the flowers – and on kraft! Swoon! Gorgeous card and your coloring — fabulous! Wow, such a beautiful card. Fabulous job with the coloring. 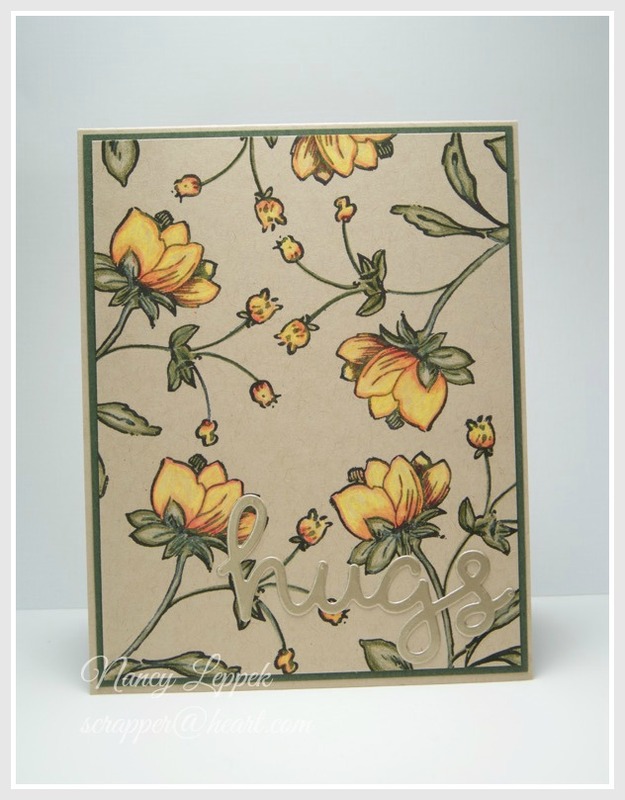 Love the flowers done in yellow and on kraft too. Nancy, this is so pretty. Love the coloring on kraft. I really should try that. I don’t use kraft that much or my color pencils. You’ve inspired me to try this. Thanks for your kind words Linda! You always brighten my day! Wish we could create together! I’m with Barb, I don’t like it when you are sick either!!! Hope you and the hubs are on the mend. Your card is just gorgeous, I love the look of pencil on kraft. I’m pinning….thanks for the great inspiration. Your coloring is outstanding….heck I love everything about this card! So much beauty and softness. Amazing colouring and so nice on kraft cs. Love the muted colour of the sentiment – just blends in perfectly. Wow! Those beautiful flowers on the kraft are gorgeous! Your coloring is so soft and just glows. Amazing! Thanks so much Darnell! What a nice surprise this morning when I read your message! I appreciate your kindness a lot!